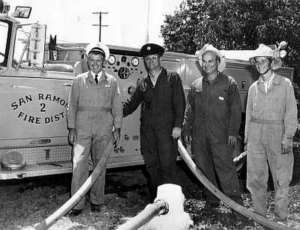 The year 1963 was a big one for fire fighting in San Ramon. Growth was in the air as the new Aerojet General plant expanded and the new freeway alignment was debated. At least two people thought that the East Contra Costa County Fire Protection District was not providing enough service for San Ramon. The ECCCFPD covered a huge area of the county – 177 square miles from Moraga to Brentwood. Led by William J. Fereira and Howard Wiedemann, the San Ramon Fire Protection District was born. Bill and his two brothers had grown up in the little village of San Ramon where their father, William Sr., was the San Ramon General Store owner and postmaster. Wiedemann was a prominent rancher whose family had lived in San Ramon since the 1860s. Aerojet General began its San Ramon plant in 1957 and became the area’s largest employer. The company researched new ideas in peaceful use of the atom and made training and research reactors. It eventually hired 800-1000 people, including Bill’s brother Howard Fereira. Aerojet had its own fire brigade and installed the first fire hydrant in San Ramon. After the war Fereira had gone to the community college for fire science courses and was a Danville Fire District volunteer. Trained as a mechanic, he opened a garage next door to the San Ramon General Store. In the fifties San Ramon’s fire service was run out of Fereira’s garage as part of the ECCCFPD. He housed an ECC fire truck and jeep, made a 100-mile trip each month to service other fire trucks in the East County, and answered fire calls 24 hours a day from a phone in his home. For these services he was paid $50 a month. Fereira tells some colorful stories about the District’s beginnings. Fereira and Wiedemann talked to the County Supervisor Mel Nielsen about a San Ramon Fire District with its own budget. Nielsen agreed, but wanted it to be a dependent county fire district with a county-approved commission and budget. But the two San Ramon men wanted an independent district for San Ramon similar to Danville’s. Independent districts had locally elected commissioners with the power to adopt a budget. A lawyer friend of Wiedemann’s provided the county staff with a report for the Board of Supervisors which created such an independent district. Evidently Nielsen didn’t read the report carefully because the Board voted to create an independent fire district for San Ramon on Jan. 29, 1963. When he found out, Nielsen was “hopping mad,”, according to Fereira. Nielsen tried unsuccessfully to rescind the vote. Then Chief Al Bates of the ECC Fire District swept in and took the county fire equipment from San Ramon. Fereira said he began hiding tools -- McClouds, cans and other firefighting items, but lost the trucks to ECC. Then Bates sent a man to take the fire siren down off its pole. Fereira got mad and threatened to shoot the guy down “like a jaybird.” The siren was a former Civil Defense siren Bill had scrounged from San Francisco, not an ECC one. The first Fire Commissioners were Larry Davidson, Armand Borel, Micky Schlesinger, Howard Wiedemann and A. C. “Johnny” Johnson. The district boundary was about 20 square miles, included the Tassajara Valley on the east and stretched from the Danville district on the north, to the Dublin San Ramon Services District on the south. It had no money for six months, according the Fereira. The Commissioners hired him as their first paid employee, making him a part-time caption for $300 a month while he continued to work at his garage. Bill had to borrow a truck at first but was able to use the tools he had squirreled away. He remembers that it was hard to get volunteers because “there was nobody here” but he began with 12-13 men. He did pretty much everything – the budget, finding more trucks, and answering calls 24 hours a day. On July 1, 1963, the new San Ramon Fire Protection District was able to tap a portion of the property tax and begin to acquire its own equipment. The District was on its way after its lively and successful beginnings. Sources: Valley Pioneer , Feb. 2, 1963, June 23, 1965, Dec. 22, 1976, interviews with Bill Fereira, 1997 and 2008.